Many people may not be aware of the damage caused by UV rays on the eyes and the vision. Hence, may is declared as the UV awareness month to educate people to know about the dangers of UV and the steps to protect vision. Since the damages caused by UV are instantaneous and accumulative, it is a must to learn ways to protect your eyes and eyesight. Corneal Sunburn - Long hours at the beach or skiing without proper eye causes this. Wraparound sunglasses – When buying sunglasses, it is a must to look for the ones that block up to 100% of both UVA and UVB radiation. Raising awareness is very important for every cause. 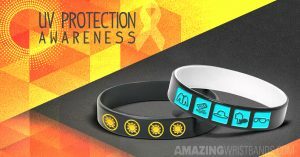 You can use custom-designed silicone bracelets to support your cause amazingly and they can spread the message of prevention that may save someone’s vision. When you create custom awareness bracelets, you can choose any color, or combination of colors that you’d like. You can put any message you’d like on your awareness bracelets, from something simple to something specific based on your cause or event. Amazing Wristbands is a leading provider of customized silicone wristbands available online. Our wristbands are comfortable, durable, and non-allergenic. Our professional and friendly customer service agents will help you design a customized awareness wristband that will remind you about the safety measures always. Call us at our toll-free number 1-800-269-0910 or you can e-mail us at customercare@amazingwristbands.com. We offer a wide variety of wristband types and colors to help your wristbands stand out and make a difference. In addition to standard wristbands, we also offer slap bands, adjustable bands, USB bands, rings and keychains, medallion bands, rings and Led bands. FREE Shipping on all the products in the U.S.
FREE artwork and design for all the wristbands. FREE Color Matching – choose the color that chooses your event. 24 to 72 hours, delivery of selected products and 5 - 10-day production for other orders. Get a detailed wristband quote for your asthma allergy alert bracelets in minutes! By educating people about the significance of protecting their vision, everyone can be able to save their sight for the generations to come. UV rays come from many directions, namely: sun, reflection from the ground, water, snow, sand and other bright surfaces. Please visit the available dedicated websites to know about the eye care, dangers of UV exposure and UV protection.